Mondays on Memory Lane: MICHAEL JACKSON 8-29-1958 TO 6-25-2009 – On June 25, 2009, Michael Jackson was murdered by his so-called doctor, Conrad Murray, by acute propofol and benzodiazepine intoxication and suffered a heart attack in his home on North Carolwood Drive in the Holmby Hills neighborhood of Los Angeles. In August of 1967 Michael (age 7) and The Jackson 5 auditioned at the famed Apollo Theater’s talent contest and easily won first prize. Diana Ross introduced the Jackson 5 to the American television viewing audience on her TV special in 1969, the rest is history. Forty years later the story horrifically came to an end on a day in June of 2009. The news was shocking. On the west coast fans had several places to mourn, the hospital, his home and Hollywood Blvd’s Walk of Fame. 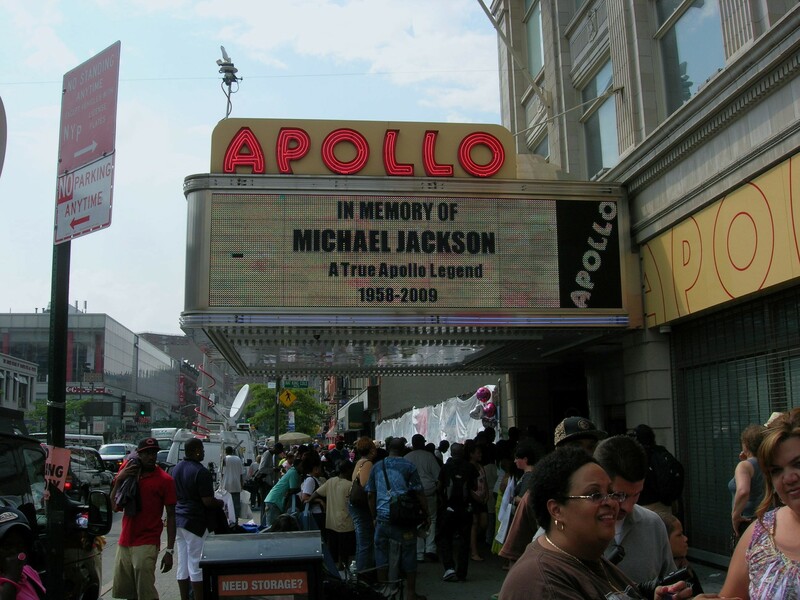 On the east coast fans surged to New York’s Apollo Theater on Harlem’s 125th Street where Michael was discovered. It was one of those summer heat waves where you felt like you can fry an egg on the sidewalk, but people came by the thousands. You had to stand in line for two blocks to get to the front of the theater to leave flowers or leave mementos behind. 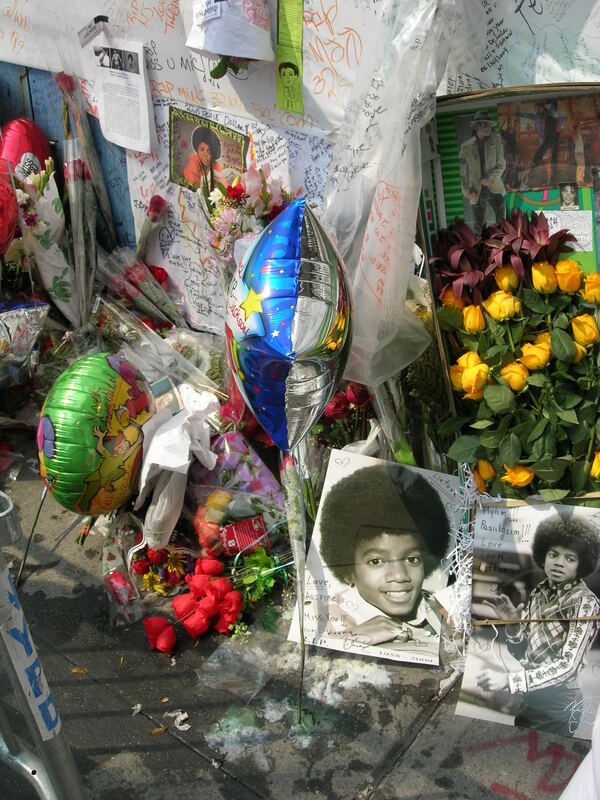 Street vendors lined the street with everything ‘Michael’ for sale, his music blared from every stand. Worldwide TV crews were everywhere. Directly to the left of the Apollo was an empty lot surrounded by a blue wooden wall. 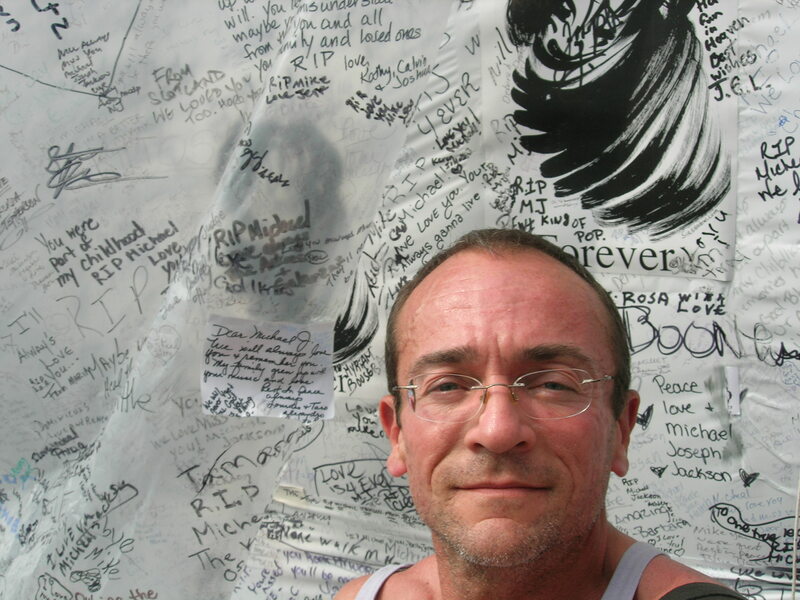 Fans instinctively took out their felt tip pens and started writing messages of love to Michael. Within a few days the wall started to turn black from all the signatures. 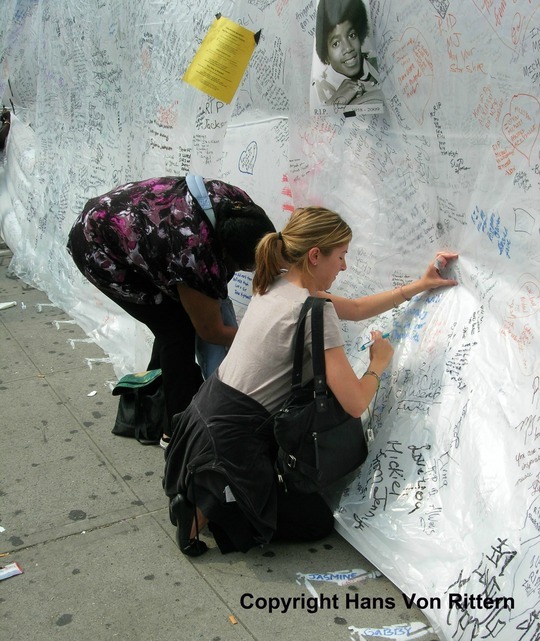 But the Apollo theater brought out plastic sheeting to cover the wall so that fans could continue to sign, day after day, the sheets filled up rapidly. On July 1st, I came to pay my respects and watch the phenomena. After I had left a few messages on the wall, I stood back and watched the people. Hour after hour in the heat and then it struck me. As I watched people signing the wall, I noticed – there was an old black woman next to a young white woman, an old white woman next to a young black woman. There were people of all colors, all ages, all genders, all persuasions. So many different languages could be heard: Finnish, German, French, Russian, Italian, Swedish, Japanese, Chinese, Spanish, all dialects. Music had brought them all together. Through Michael’s music they were all one, united, if only for that brief period in time. The love of music unites. Michael united all. Rest in peace Michael.
. . . Doctor Murray received the maximum sentence of four years. . . This entry was posted on June 24, 2013 by newyorkcityinthewitofaneye. It was filed under DAILY PHOTOS WITH STORIES OF NEW YORK CITY and was tagged with 125th Street, 2009, 8-29-1958 TO 6-25-2009, all colors, all creeds, all persuasions, apollo theater, Diana Ross, Dr. Conrad Murray, Hans Von Rittern, Harlem, Harlem Apollo Theater, Michael Jackson, Michael Jackson fans, Michael Jackson memorial at the Apollo, Michael Jackson's death, Michael Jackson's mourners, Michael was discovered, music unites, New York photo, North Carolwood Drive in the Holmby Hills, On June 25, propofol and benzodiazepine intoxication, the Jackson 5, worldwide fans.